Affordable Care Act (ACA) Compliance Services. Let Proliant assist you sort out the complexities of ACA compliance. If you employ 50 or more full-time employees and/or equivalents (FTE), you are required to prepare and file Forms 1094-C and 1095-C with the IRS. Many small to medium employers are not prepared to manage all of the complexities associated with reporting and filing Forms 1094-C and 1095-C. Proliant ACA services provides all the essential components for ACA compliance, without requiring you to have costly time and labor or benefits administration systems. Proliant migrates 17 to 28 months of detailed, historical payroll records on your behalf (relative to your start date with Proliant) to ensure that you have the information needed for IRS reporting. 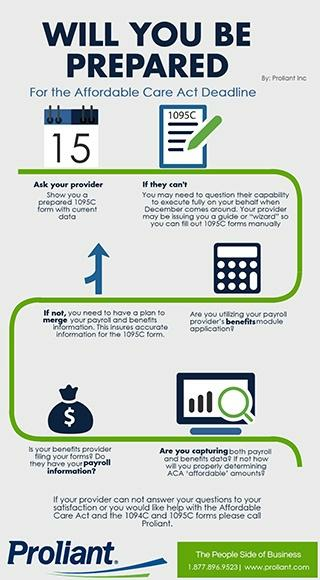 Proliant will generate and file Forms 1094-C and 1095-C.
Proliant also provides your benefit broker with an ACA portal to help you manage the process and to make informed decisions together.